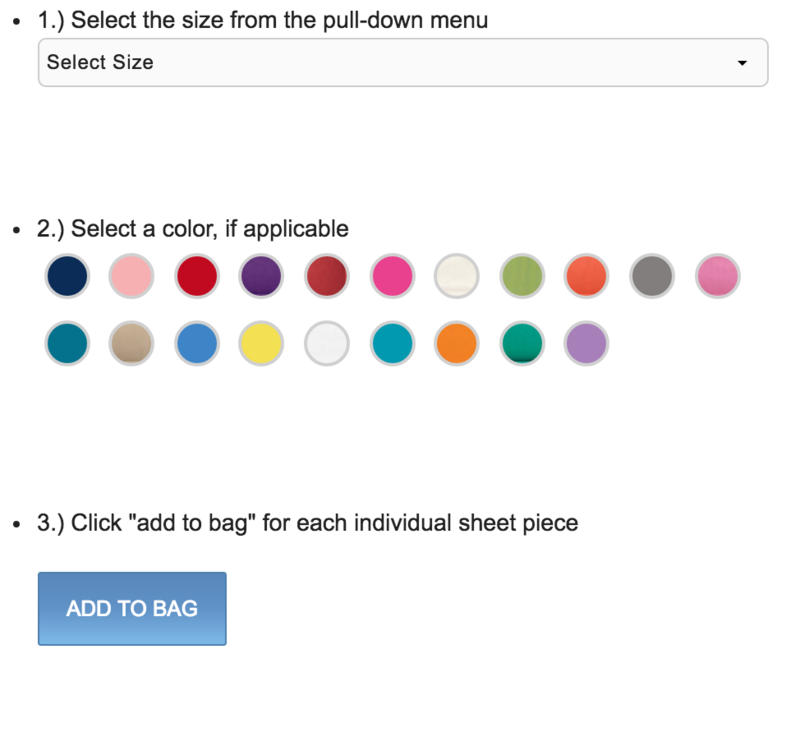 A la carte bedding: we've made it easy to buy a complete sheet set in any color or pattern—or mix and match to create your own, signature look. There are several factors that go into producing quality sheeting fabrics: fiber, weave, and thread count. What goes into the sheets you're buying? 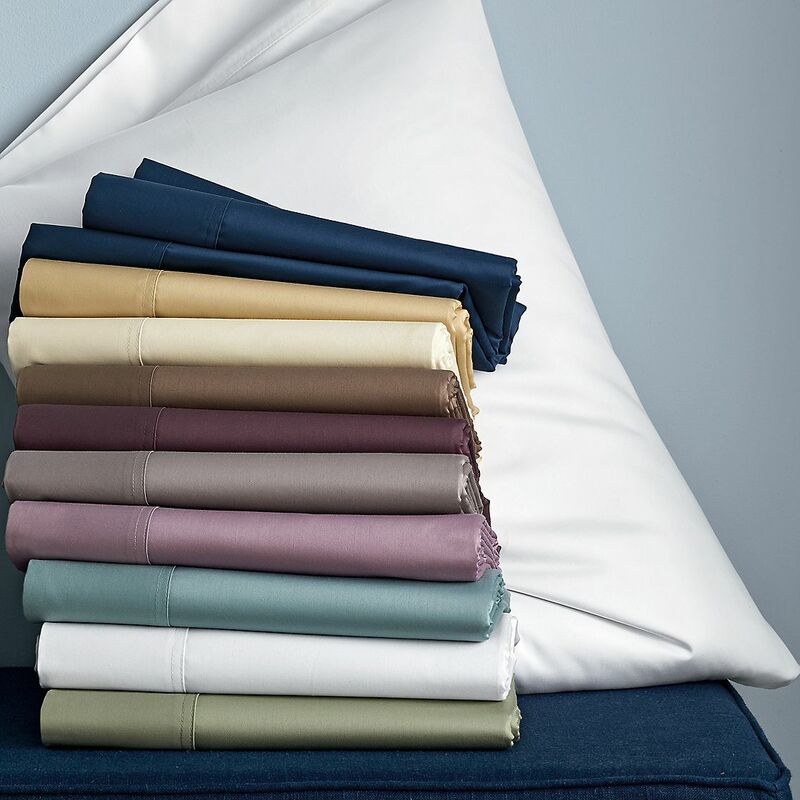 Most of our sheets are made of 100% cotton, though we also offer options with natural linen, a bamboo blend (70% bamboo rayon/30% cotton) and soft touch microfleece. How are the threads woven together? 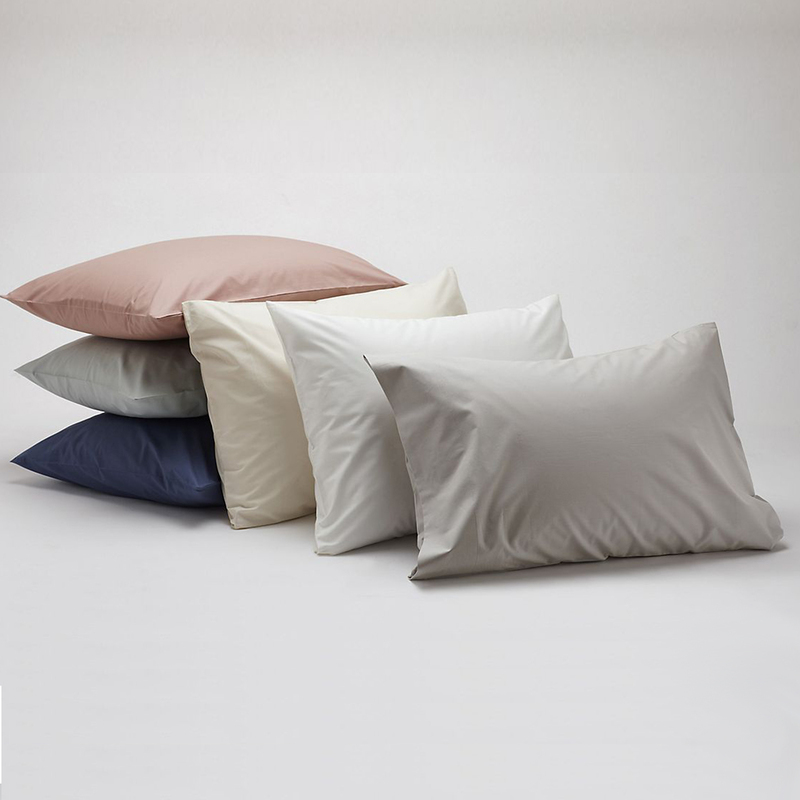 Percale is made with a balanced weave, which means the same number of threads across as down. A sateen weave has more threads across than down, which catches the light in such a way as to give it a shine. Percale weaves yield a fabric that's crisp, smooth and durable. Sateen-woven fabrics produce a very soft, lustrous feel. Thread count is a measure of the coarseness or fineness of fabric. It measures by the number of horizontal and vertical threads per square inch of fabric. Thread count, or threads per inch (TPI), is a measure of the coarseness or fineness of fabric. It is measured by counting the number of threads contained in one square inch of fabric or one square centimeter, including both the length (warp) and width (weft) threads. The thread count is the number of threads counted along two sides (up and across) of the square inch, added together. Thread count is often used as a measure of fabric quality, so that "standard" cotton thread counts are around 150 while good-quality sheets start at 180 and a count of 200 or higher is considered percale. 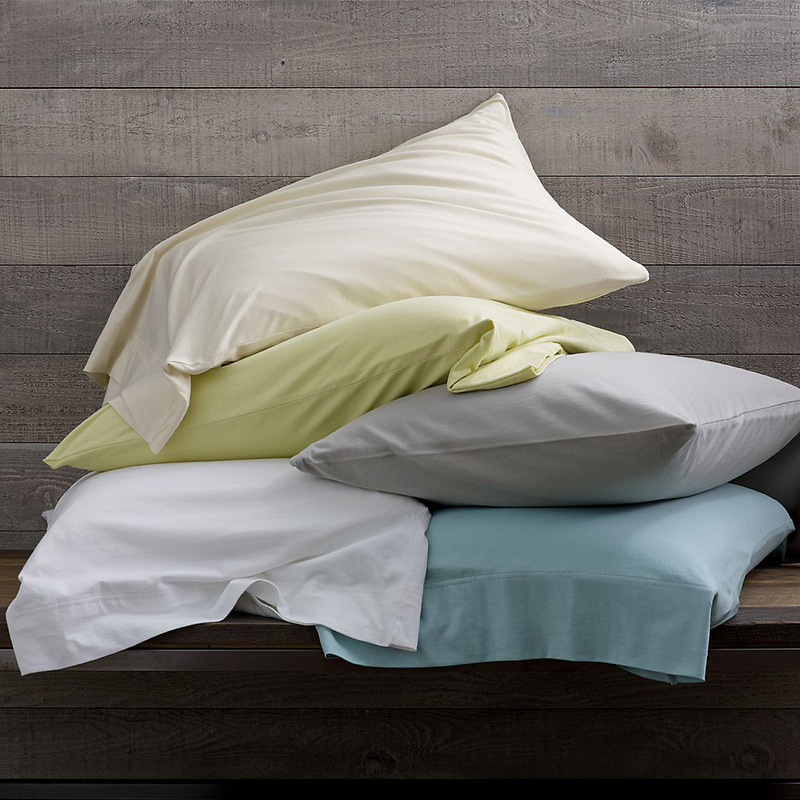 Our percale sheets are made of 100% cotton, woven into fabrics ranging from 200 to 400 thread count. Why we like them: Crisp percale sheets have a smooth, cool feel, making them perfect for sleep all year-round. They're also an excellent choice for people who tend to get warm when sleeping. Flannel sheets are soft and warm. They're made with a thicker cotton yarn, and the surface is gently brushed, raising tiny chunks of cotton on the fabric surface for a snuggly feel. These elevated pockets contain heat-trapping air, which is why the fabric feels so warm. We offer 5oz, 6oz and velvet flannel. We recommend washing before use. Why we like them: Flannel sheets are soft, warm, and cozy as can be. They're perfect for cold-weather months, or year-round for those who prefer a cozy feel or sleep in a cooler room. Sateen sheets are the closest to feeling like true silk. They're luxurious, smooth and tend to be made with higher thread-count fabrics. The result is an exceptionally soft feel and smooth lustrous finish. Why we like them: Unbelievable silky smoothness—need we say more? They're luxuriously soft and the sateen shine offers a lustrous, elegant look. Linen is a natural fiber derived from the flax plant. Since linen threads aren't as fine as cotton, they provide more space for air to pass through, making them wonderfully breathable (that's why linen is such a popular choice for summer clothes). 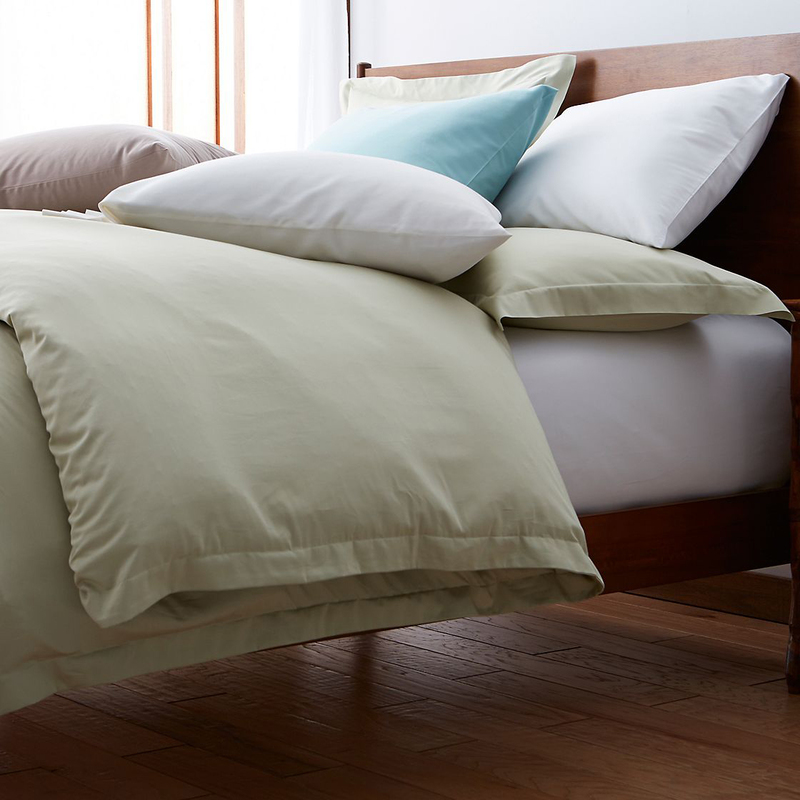 Linen sheets absorb and wick away moisture. We pre-wash our linen sheets for softness, so they have that perfectly broken-in hand from day one. The more you wash them, the softer they'll get. 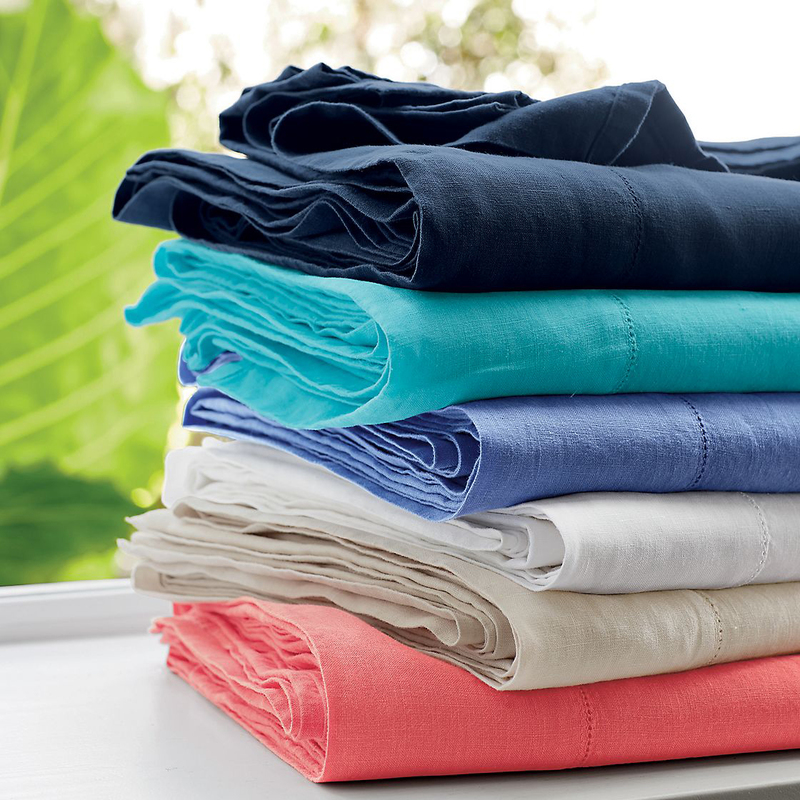 Linen sheets can be pressed if you prefer, but we like the cool, casual look they have straight from the dryer. When caring for linen sheets, we recommend not using excessive heat in drying and removing them promptly to minimize any wrinkling. Why we like them: Linen sheets are lightweight, breathable and comfortable—a great choice for summer sleep. 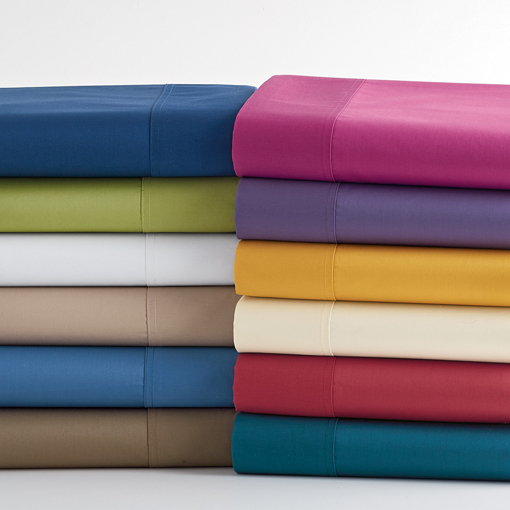 Our bamboo sheets are made from a blend of 70% rayon from bamboo and 30% cotton. Tough, resilient bamboo is processed into a fine yarn that's exceptionally soft, smooth, and durable, as well as naturally breathable and absorbent. 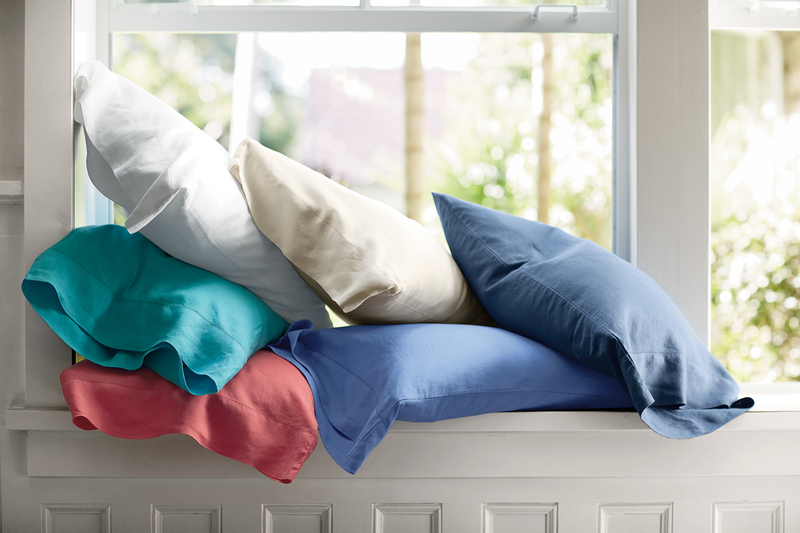 Why we like them: Exceptionally soft and durable, they're breathable and silky-soft to the touch. 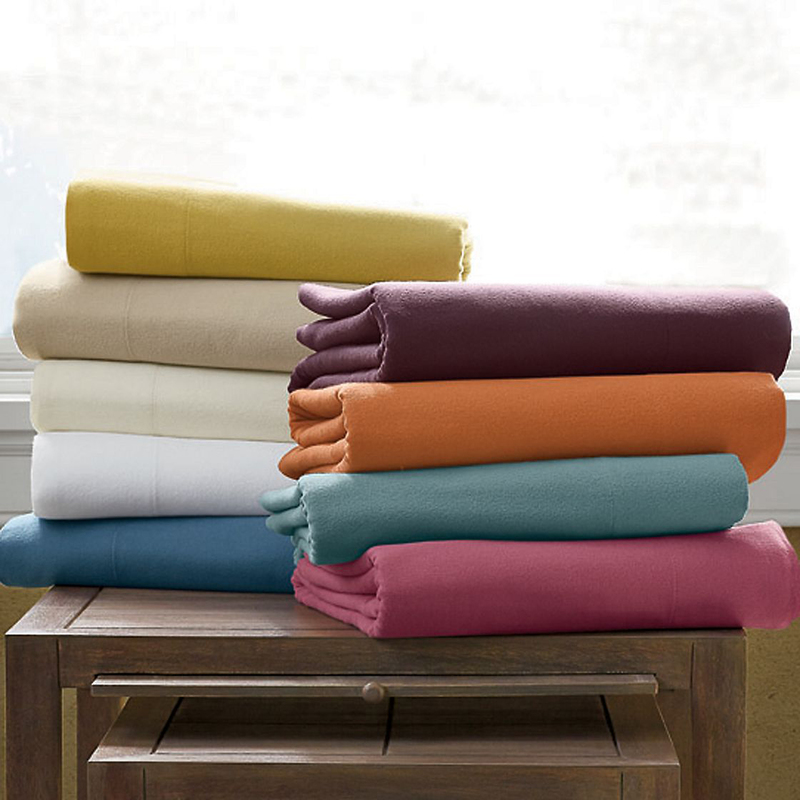 Unlike cotton percale sheets, which are woven, cotton jersey sheets are knit. Soft, stretchy and relaxed, they have the same comfy, broken-in feel as your favorite vintage t-shirt. Why we like them: Jersey sheets are t-shirt soft and feel great against the skin. The natural stretchiness of the fabric makes it naturally wrinkle-free and easy to care for. Our certified organic cotton sheets are good for you and the planet. All of our organic sheets are made with organic cotton, which has certified according to strict Global Organic Textile Standards (GOTS) to ensure the organic quality of the materials and the environmental and social responsibility of the textiles, from harvesting through manufacturing. Our organic sheets have a percale weave for an exceptionally soft and smooth hand. Why we like them: In addition to being smooth and soft to the touch, these eco-friendly, certified organic cotton sheets are responsibly made so that they're better for you and the planet. 39 in. x 75 in. x 14 in. 39 in. x 80 in. x 14 in. 54 in. X 75 in. x 14 in. 60 in. x 80 in. x 14 in. 78 in. x 80 in. x 14 in. 72 in. x 84 in. x 14 in. 28 in. x 52 in. x 4 in. 28 in. x 52 in. x 6 in. 20 in. x 26 in. 20 in. x 36 in. 26 in. x 26 in. 70 in. x 90 in. 84 in. x 90 in. 90 in. x 96 in. 108 in. x 96 in. 66 in. x 96 in. 81 in. x 96 in. 90 in. x 102 in. 108 in. x 102 in. - - - 90 in. x 108 in. 114 in. x 108 in. 108 in. x 112 in. - - - 60 in. x 80 in. x 18 in. 78 in. x 80 in. x 18 in. 72 in. x 84 in. x 18 in. 39 in. x 75 in. x 14 in. - 54 in. x 75 in. x 14 in. 60 in. x 80 in. x 14 in. 78 in. x 80 in. x 14 in. 72 in. x 84 in. x 14 in. 39 in. x 75 in. x 14 in. 39 in. x 80 in. x 14 in. 54 in. x 75 in. x 14 in. 60 in. x 80 in. x 14 in. 78 in. x 80 in. x 14 in. 72 in. x 84 in. x 14 in. 39 in. x 75 in. x 16 in. 39 in. x 80 in. x 16 in. 54 in. x 75 in. x 16 in. 60 in. x 80 in. x 16 in. 78 in. x 80 in. x 16 in. 72 in. x 84 in. x 16 in. 60 in. x 80 in. x 16 in. 78 in. x 80 in. x 16 in. 72 in. x 84 in. x 16 in. 20 in. x 26 in. 20 in. x 36 in. 26 in. x 26 in. 16 in. x 24 in. 70 in. x 90 in. - 84 in. x 90 in. 90 in. x 96 in. 108 in. x 96 in. 66 in. x 96 in. - 81 in. x 96 in. 90 in. x 102 in. 108 in. x 102 in. 39 in. x 75 in. x 14 in. 39 in. x 80 in. x 14 in. 54 in. x 75 in. x 14 in. 60 in. x 80 in. x 14 in. 78 in. x 80 in. x 14 in. 20 in. x 30 in. 20 in. x 40 in. 39 in. x 75 in. 39 in. x 80 in. 54 in. x 75 in. 60 in. x 80 in. 78 in. x 80 in. 28 in. x 52 in. x 4 in. 39 in. x 75 in. x 14 in. 39 in. x 80 in. x 14 in. 54 in. x 75 in. x 14 in. 60 in. x 80 in. x 14 in. 78 in. x 80 in. x 14 in. 28 in. x 52 in. x 4 in. 39 in. x 75 in. x 14 in. 54 in. x 75 in. x 14 in. 60 in. x 80 in. x 14 in. 78 in. x 80 in. x 14 in. 39 in. x 75 in. x 14 in. 54 in. x 75 in. x 14 in. 60 in. x 80 in. x 14 in. 78 in. x 80 in. x 14 in. 28 in. x 52 in. x 4 in. 28 in. x 52 in. x 4 in. Most of our sheets come with a 14 in. deep fitted sheet. This is a bit more generous than the industry standard of 7-12 in., because mattresses have gotten deeper over the past generation, and with the increasing popularity of pillow top and plush mattresses, the trend has only continued. So we also offer a wide array of extra deep sheets, ranging in depth from 16 to 20 in. Before buying sheets, measure your mattress. Anything from 7-14 in. high will fit our standard 14 in. fitted sheets. The elastic edges are easy to tuck in, and will stay snugly in place, even on a thinner mattress. 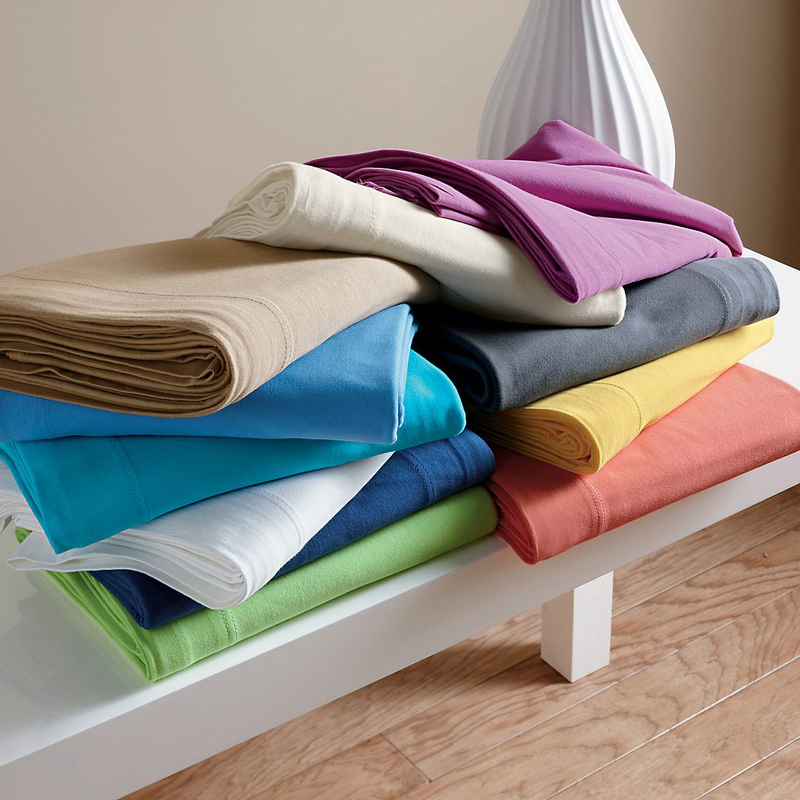 If you have a plush, pillow top, or otherwise extra deep mattress, explore our deep pocket sheet sets. Note that many of our sheet sets offer both standard and extra deep fitted sheets, so keep an eye out for the deep option. We recommend washing before use. Machine wash cold, gentle cycle, with like colors. Use only non-chlorine bleach when needed. Tumble dry low, warm iron as needed. We strongly recommend drying all of our sheets on low to medium heat, and removing them promptly from the dryer. While they may dry more quickly when set to high, they're also likelier to wrinkle and they won't last as long. Most of our sheets will look great without ironing: Remove promptly from the dryer and press them with your hand before folding.